100% synthetic "fuel economy" engine oil specifically designed for Hybrid Electric Vehicles (H.E.V) and Plug-in Hybrid Electric Vehicles (P.H.E.V). Also suitable for Battery Electric Vehicles (B.E.V) fitted with thermal gasoline engine used as a range extender. Compatible with modern gasoline engines requiring viscosity grade SAE 0W-20 lubricant or a "fuel economy" lubricant in viscosity grade 20. Standards API SN, API SN-RC and/or ILSAC GF-5. 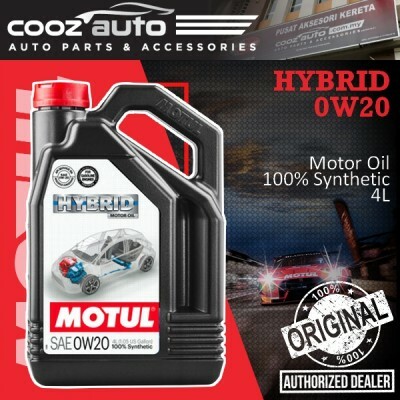 Motul HYBRID 0W20 is a 100% synthetic "fuel economy" engine oil specially designed for Hybrid-Electric Vehicles (H.E.V) and Plug-in Hybrid Electric Vehicles (P.H.E.V) fitted with recent gasoline engines, turbocharged or naturally aspirated, direct or indirect injection, designed to use SAE 0W-20 oil with low friction and very low HTHS (High Temperature High Shear) viscosity (≥ 2.6 mPa.s). Also suitable for Battery Electric Vehicles (B.E.V) fitted with thermal gasoline engine used as a range extender. Compatible with modern gasoline engines requiring a viscosity grade SAE 0W-20 lubricant or a "fuel economy" lubricant in viscosity grade 20. Standards API SN, API SN-RC and/or ILSAC GF-5. Compatible with catalytic converters and all driving conditions: city, road, highway. THIS TYPE OF OIL MAY BE UNSUITABLE FOR USE IN SOME ENGINES, REFER TO THE OWNER MANUAL WHEN IN DOUBT.